Bäco Mercat: Where it's Hip to be a Carnivore. Finally. Damiano Ciolli, Birk O’Halloran and Leticia at Vinitaly 2013. There are very few wines indigenous to the region of Lazio, and even fewer from the area close to Roma. That’s what makes the Cesanese grape so very special. It’s unique, it’s esoteric, and it makes a seriously delicious wine in hands of capable and passionate winemaker like Damiano Ciolli. His straight-forward Cesanese “Silene” is matured in large, neutral barrels. The wood does much less to flavor the wine than it does to simply help the exchange of oxygen during maturation. It’s a decidedly savory wine with notes of wild sage, wet earth and blackberry. 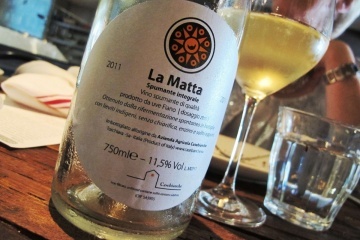 Deep and rich- this wine is a shining example of the potential of Lazio’s wine making terroir. I will be visiting this estate in person soon- can’t wait to see the vineyards in person and to revisit the wines closer to their birthplace. Damiano Ciolli himself is a sweet, jovial, handsome young winemaker, with a tendency to speak in rapid-fire, heavily-accented Italian. I am already equally as excited to see him again as I am terrified of attempting to translate for him. A presto, Damiano. Bravo! Trust me. It’s me and Frank Cornelissen @SottoLA! You mean to tell me that all these years I have been wrong in pronouncing Cesanese as ‘ceeze- a- kneeze. Well damn. Captain you are HILARIOUS! I miss you. We need to get together soon! Ciao Letizia! I can’t wait to see you in Lazio! Very interesting! We’ve just been visiting a Cesanese producer (Coletti Conti) in Anagni, Lazio. Definitely an amazing variety! We’ll also look for Damiano Ciolli asap! You must find Damiano! His wines are truly special and he is so committed to understanding and researching the potential of this grape. Inspiring wines! The Cesanese grape has the potential to be one of the world’s noble grapes if allowed. I live in Lazio winemaking country so I drink a lot of the stuff from local farmers. I really like Damiano Ciolli’s wines a lot. I am going to Olevano on Saturday and can’t wait to taste wines from some other winemakers.